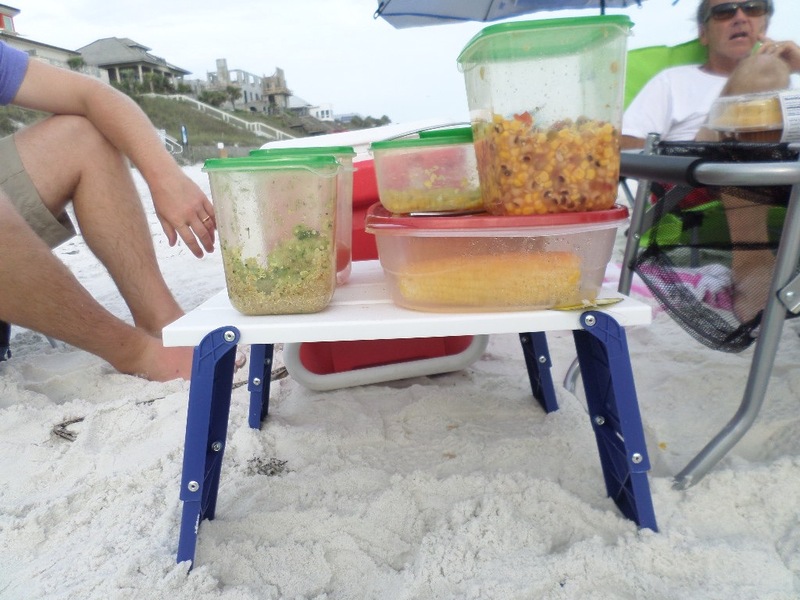 Use a folding beach table with your beach chairs to place your food, drinks, books, phones or anything else you don't want left on or near the sand. We love to bring our dinner to the beach and watch the sunset, chase crabs and walk the beach. Made of hard durable plastic, this table offers two adjustable heights. A powder coated steel-frame makes for a rust-resistant sturdy table. The table top open size measures 16"W x 14.5" D and folds to 16W x 7.25D x 2.3H. The height of the table is 6" and can be adjusted into two different heights by flipping the legs. It provides the right height for low beach chairs. 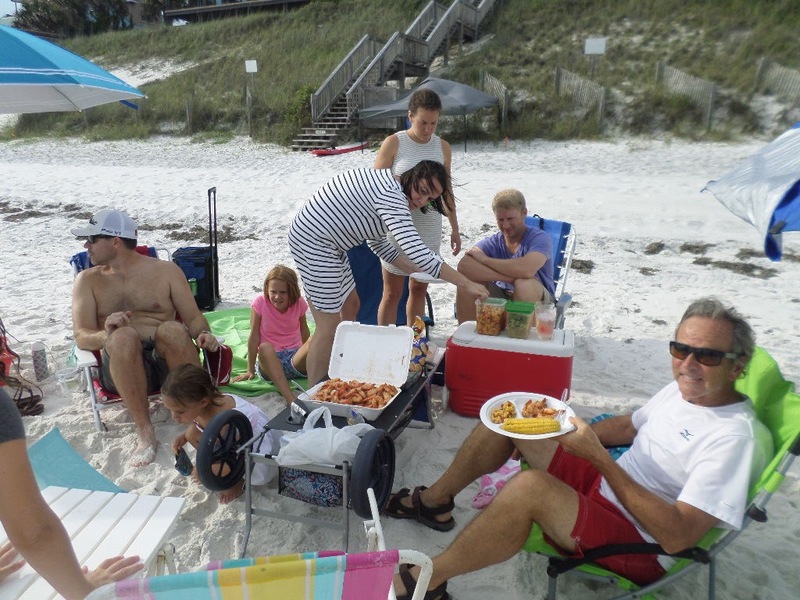 The easy set up makes it convenient while the folded table ( which comes with its own carry bag) is small enough to fit into the back pocket of our beach chair. When you're hauling lots of stuff to the beach small and light weight are the key words. Just hose the sand off with water and you're ready for your next day at the beach. 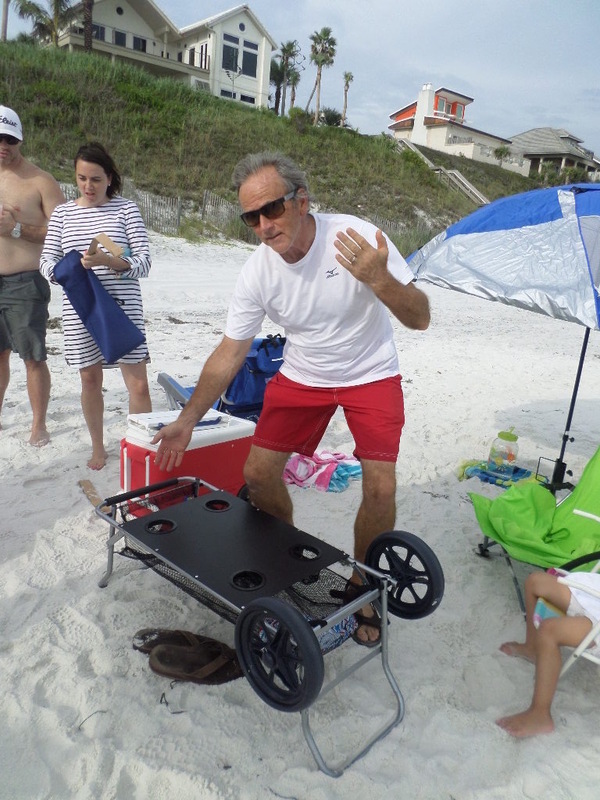 A dual purpose beach cart and table means one less thing to carry to the beach. 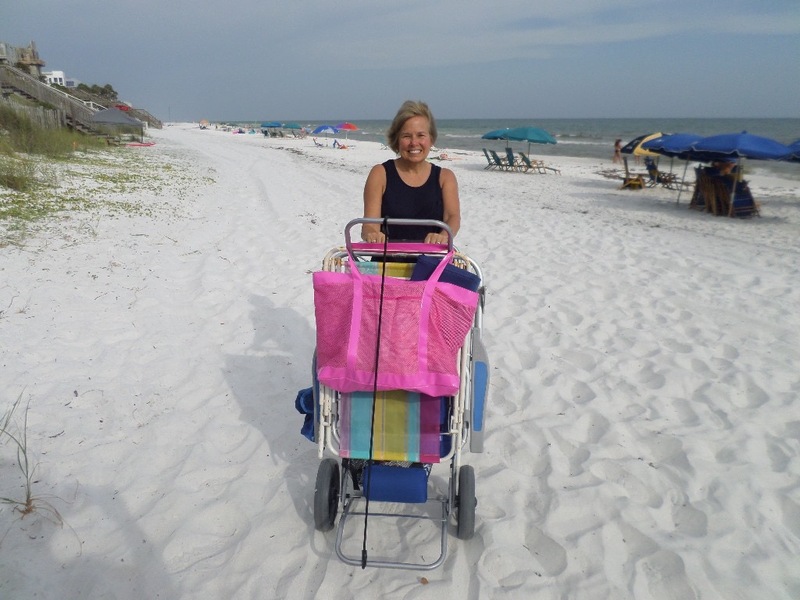 The beach cart can carry up to 4 chairs, umbrellas, towels and other beach items. An included bungee cord keeps everything secure. The frame is made of rust resistant Powder Coated Steel Tubing. When assembling be sure that the metal tube spacer is in between the tubes when sliding the metal rod through. When you insert the wheel into the metal rod, press firmly until you hear it click. The cart rolls well in fine, firmly packed sand and a little more effort in soft, deep sand. The removable wheels allows the cart to fold almost flat for easy storage. If you want to remove the wheel, just press the silver metal clip down and pull the wheel out. Just flip the cart over and extend the upper and lower arms to rest on the sand. You have a nice long table with 4 deep pockets. Use them to hold plastic silverware, napkins or beverages. Just the right height for your beach chairs. Cup holders - that are nice and deep - provide a safe place to keep your drinks and valuables out of the sand. We used one of the pockets to hold our plastic utensils and napkins. This canvas topped table is made of washable and mildew resistant fabric. The frame is made out of strong aluminum leg. When the table is open is measures 21" L x 21" W x 16" H and it weighs 3 pounds. Convenient cup holders (two of them) and an umbrella hole make for a winning combination at the beach. 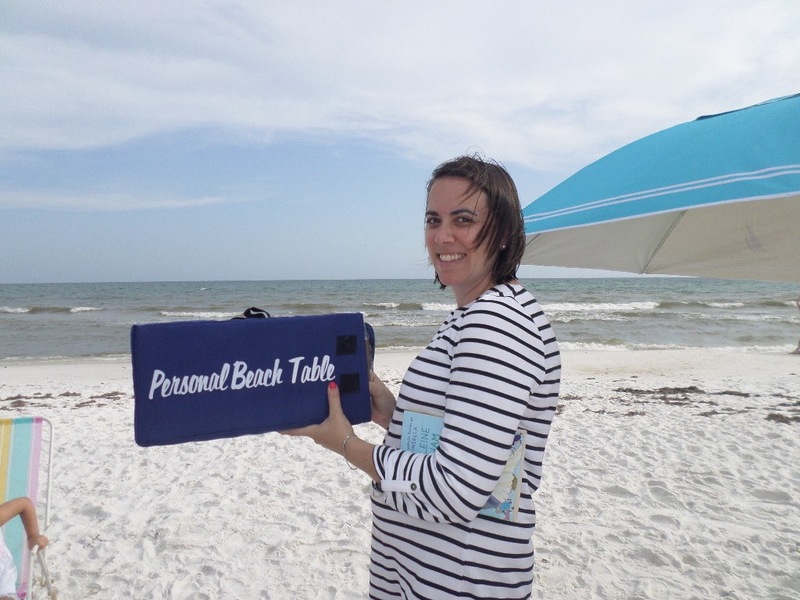 Mesh storage pockets keep valuables, books or magazines out of the sand. It folds up into the included carry bag for easy storage. Ultra Lightweight Folding Aluminum Beach Table with Cup Holders, Mesh Storage Pockets and Two Inch Umbrella Hole. It's like getting two tables in one. The canvas table top can be used to play games or eat your meals. 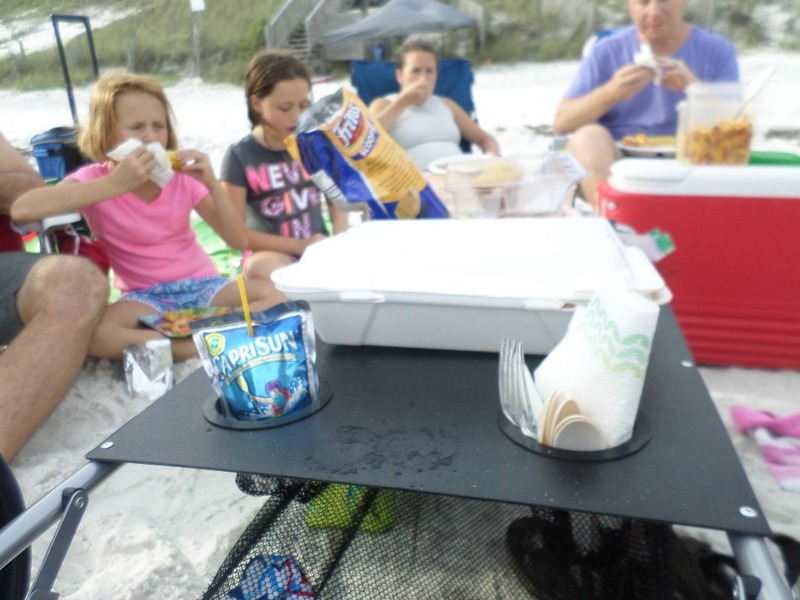 The four cup holders are under the canvas providing more room on the table top and keeping your drinks out of the sun and sand. The side bag can hold your magazines, Kindle, phone or camera. It measures a square 27" x 27" and comfortably fits two to 4 plates. It's quick and easy to set up - it just takes seconds. The tighter you adjust the four corner straps, the sturdier the top will be. Carrying bag makes it quite portable whether it's to the beach, the park or for camping.